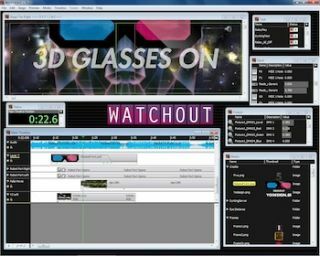 Linköping, Sweden--Dataton will bring its WATCHOUT 5.2 multiple image and display software for the first time to InfoComm 2012. WATCHOUT will be showcased on the main aisle booth (Booth N1641) at InfoComm together with the Dataton PICKUP audio guide system. Along with their partner Show Sage, Dataton will launch its Academy program offering in-depth training and education sessions for their North American customers highlighting how they can make the most out of their presentations, events and productions. WATCHOUT version 5.2 multi-display production and playback system is fully scalable, software based and does not require proprietary hardware. It orchestrates still images, animations, graphics, video, sound and live feeds into a single show across multiple display areas, either soft-edge blended or scattered. Version 5.2 integrates video streaming and devices such as network cameras to allow video to be accessed over a standard network solution. It also offers the ability to interact with live components and assets of interactive media. Users can position, rotate and move all media objects in 3D and interactively. WATCHOUT integrates with various devices and external systems so users can connect sensors and control sources, such as iPads, to on-screen elements like images, video and live feeds. A built-in text editor allows last minute changes, or additions, in presentation text without the need for graphics software such as Photoshop. Version 5.2 also has a DMX learn function that lets you record a complete lighting show and play it back from a single cue in WATCHOUT.